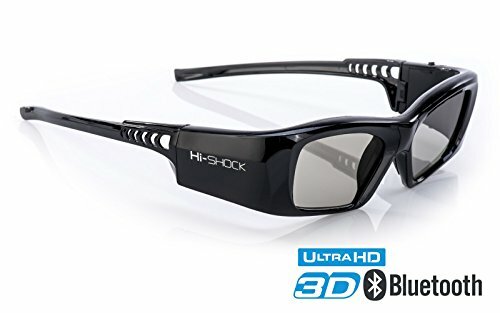 Samsung-Compatible Hi-SHOCK 3D active Glasses | Rechargeable | For 2013-2018 SAMSUNG, SHARP, LG Plasma, PANASONIC, Sony Full HD/HDR/4k TV |"Black Diamond"
✓ This high end 3D glasses provide one of the brightest resolutions on the market due to its newly invented reaction-strongly and extremely lucent LCD's. Enjoy realistic depth mode and impressive HD resolution with a better brightness, sharpness & contrast as comparable products can provide. Your complete 3D experience will be improved. ✓ Designed for optimal lenses coverage even over Prescription Eyewear. With its special design choice of light and flexible materials this glasses are so comfortable that you almost don't feel them on your skin. 32 grams of weight make this glasses as light as polarizing glasses. The dust-rejecting SOFT COAT surface ensure a safe and pleasant fitting. ✓ Low power consumption, low battery detection and high capacity rechargeable battery, provide the longest work life for the glasses! It adopts the American low power consumption IC and self low battery detection design, and the high capacity rechargeable battery which can be recycled. The LED indicator shows current charging status. Intelligent switching circuits turn off the glasses after 5 minutes if they are unused. ✓ Safety & Quality: CE, FCC, ROHS, CB, REACH certified product. Attention! It's obvious that some enterprises plagiarized many aspects of our devices, from design and shape of 3D glasses to electronic aspects as well. We do not accept any warranty claims for not licensed products. Kindly note ,that application of inferior 3D glasses may influence the visual effect negatively or impair your well-being. ✓ The creative fashion design of Hi-SHOCK Shutter 3D Glasses, represent the passion for life. Hi-SHOCK accessories complement our product range ideally. From hardcases for safe storage of high-quality 3D glasses to replacements, adaptors & care products - Hi-SHOCK is always the right choice. OFFICIAL Adult Passive Polarized 3D Glasses Pack for Passive 3D TV's Televisions from SONY, LG, Vizio, Toshiba, LG, Philips, Panasonic and JVC - also for use in Real-D 3-D Theaters - 10 Pairs - Includes 2 3DHeaven PREMIUM KIDS SIZED PAIRS!